Papers: 3 audiotapes (1974-1978) in Westinghouse Broadcasting Company Collection, 1945-1981. Oral History: 13 pages. Interview as part of series on Ethnic influences and American foreign policy. Papers: Correspondence in William J. McGill papers, 1929-1979; and James Gutmann papers, 1966-1976. Papers: Correspondence in Robert E. Keeton papers, 1962-1977; and Sheldon and Eleanor T. Glueck papers, 1911-1972. Finding aid. Papers: In Angela R. Parisi papers, 1940-1961. Finding aid. Papers: 1786-1978 (bulk 1955-1975). 187.6 linear feet. 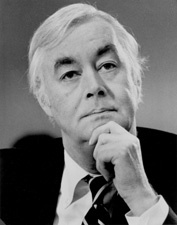 Personal papers including correspondence, journals, speeches, writings, reports, memoranda, notes, research material, subject files, appointment books, press releases, printed material, clippings, and photographs documenting his pre-senate career, chiefly 1955-1977, as adviser to New York Gov. W. Averell Harriman; U.S. Dept. of Labor official; presidential adviser to Richard M. Nixon, John F. Kennedy, and Lyndon B. Johnson; U.S. representative to the United Nations and ambassador to India; professor of urban politics and education at Harvard University; and director of the Joint Center for Urban Studies at Harvard and Massachusetts Institute of Technology. Finding aid. Also senatorial papers, 1977-2001, including microfilm of constituent correspondence. Additional correspondence in the Louise Bates Ames papers, 1915-1989 (bulk 1950-1975); William J. Brennan, 1945-1998 (bulk 1956-1990); Reinhold Niebuhr papers, 1907-1994 (bulk 1930-1990); Nathaniel Alexander Owings papers, 1911-1983 (bulk 1960-1980); Norman Podhoretz papers, 1951-1982; Alice M. Rivlin papers, 1964-1988; Bayard Rustin papers, 1942-1987 (bulk 1963-1980); and William Safire papers, 1953-1980 (bulk 1960-1973). Papers: 1976,1982,1988, and 1994. 3.75 inches. 31 senatorial campaign commercials. Papers: Correspondence in the Edwin M. Yoder papers, 1945-1998.